Now it’s all about you. 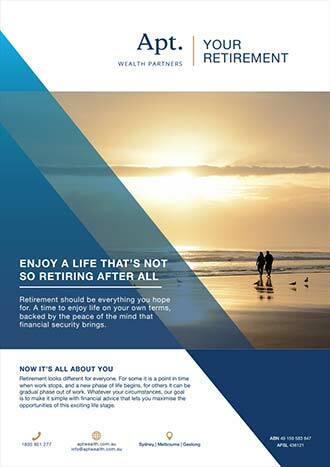 Ensuring you have the right financial plan for your retirement is something that is crucial for all of us. Retirement looks different for everyone. For some it is a point in time when work stops, and a new phase of life begins, for others it can be gradual phase out of work. Whatever your circumstances, our goal is to make it simple with financial advice that lets you maximise the opportunities of this exciting life stage. Our focus is on understanding your specific situation. The advice we share reflects our analysis, experience, understanding of your needs, and genuine desire to help you achieve a financially secure retirement. Our goal is to impress you with results – not confuse you with jargon. 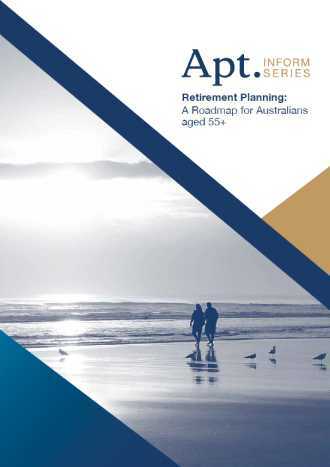 You will always understand where your money is invested with Apt, and whenever you have questions, we’ll be here to provide answers..
With a skilled team of over 40 professionals, Apt Wealth Partners has been helping Australians achieve their financial goals for over 30 years. We’ve helped our clients navigate everything from ‘the recession we had to have’ to the global financial crisis, and we can help you forge a personal path to financial security in retirement. Retirement means different things to each of us. That’s why our first step is simply getting to know you. No hard sell. No one-size-fits-all plans.